The PDP-8 was a 12-bit minicomputer produced by Digital Equipment Corporation (DEC). It was the first commercially successful minicomputer, with over 50,000 examples being sold over the model's lifetime. Its basic design followed the pioneering LINC but had a smaller instruction set, which was an expanded version of the PDP-5 instruction set. Similar machines from DEC were the PDP-12 which was a modernized version of the PDP-8 and LINC concepts, and the PDP-14 industrial controller system. A PDP-8 on display at the Smithsonian's National Museum of American History in Washington, D.C.. This example is from the first generation of PDP-8s, built with discrete transistors and later known as the Straight 8. The earliest PDP-8 model, informally known as a "Straight-8", was introduced on 22 March 1965 priced at $18,500 (equivalent to about $150,000 in 2018). It used diode–transistor logic packaged on flip chip cards in a machine about the size of a small household refrigerator. [self-published source] It was the first computer to be sold for under $20,000, making it the best-selling computer in history at that time. The Straight-8 was supplanted in 1966 by the PDP-8/S, which was available in desktop and rack-mount models. Using a one-bit serial arithmetic logic unit (ALU) allowed the PDP-8/S to be smaller and less expensive, although slower than the original PDP-8. A basic 8/S sold for under $10,000, the first machine to reach that milestone. Later systems (the PDP-8/I and /L, the PDP-8/E, /F, and /M, and the PDP-8/A) returned to a faster, fully parallel implementation but use much less costly transistor–transistor logic (TTL) MSI logic. Most surviving PDP-8s are from this era. The PDP-8/E is common, and well-regarded because many types of I/O devices were available for it. The last commercial PDP-8 models introduced in 1979 were called "CMOS-8s", based on CMOS microprocessors. They were not priced competitively, and the offering failed. 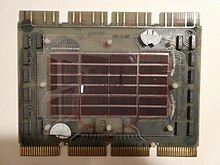 Intersil sold the integrated circuits commercially through to 1982 as the Intersil 6100 family. By virtue of their CMOS technology they had low power requirements and were used in some embedded military systems. The chief engineer who designed the initial version of the PDP-8 was Edson de Castro, who later founded Data General. The PDP-8 combined low cost, simplicity, expandability, and careful engineering for value. The greatest historical significance was that the PDP-8's low cost and high volume made a computer available to many new customers for many new uses. Its continuing significance is as a historical example of value-engineered computer design. The low complexity brought other costs. It made programming cumbersome, as is seen in the examples in this article and from the discussion of "pages" and "fields". Much of one's code performed the required mechanics, as opposed to setting out the algorithm. For example, subtracting a number involved computing its two's complement then adding it; writing a conditional jump involved writing a conditional skip around the jump, the skip coding the condition negative to the one desired. Some ambitious programming projects failed to fit in memory or developed design defects that could not be solved. For example, as noted below, inadvertent recursion of a subroutine would produce defects that would be difficult to trace to the subroutine in question. As design advances reduced the costs of logic and memory, the programmer's time became relatively more important. Subsequent computer designs emphasized ease of programming, typically using larger and more intuitive instruction sets. Eventually, most machine code was generated by compilers and report generators. The reduced instruction set computer returned full-circle to the PDP-8's emphasis on a simple instruction set and achieving multiple actions in a single instruction cycle, in order to maximize execution speed, although the newer computers have much longer instruction words. The PDP-8 used ideas from several 12-bit predecessors, most notably the LINC designed by W.A. Clark and C.E. Molnar who were inspired by Seymour Cray's CDC 160 minicomputer. The PDP-8 used 12 bits for its word size and arithmetic (on unsigned integers from 0 to 4095 or signed integers from -2048 to +2047). However, software could do multiple-precision arithmetic. An interpreter was available for floating point operations, for example, that used a 36-bit floating point representation with a two-word (24-bit) mantissa and one-word exponent. Subject to speed and memory limitations, the PDP-8 could perform calculations similar to more expensive contemporary electronic computers, such as the IBM 1130 and various models of the IBM System/360, while being easier to interface with external devices. The memory address space was also 12 bits, so the PDP-8's basic configuration had a main memory of 4,096 (212) twelve-bit words. An optional memory-expansion unit could switch banks of memories using an IOT instruction. The memory was magnetic-core memory with a cycle time of 1.5 microseconds (0.667 MHz), so that a typical two-cycle (Fetch, Execute) memory-reference instruction ran at a speed of 0.333 MIPS. The 1974 Pocket Reference Card for the PDP-8/E gave a basic instruction time of 1.2 microseconds, or 2.6 microseconds for instructions that referenced memory. The PDP-8 was designed in part to handle contemporary telecommunications and text. Six-bit character codes were in widespread use at the time, and the PDP-8's twelve-bit words could efficiently store two such characters. In addition, a six-bit teleprinter code called the teletypesetting or TTS code was in widespread use by the news wire services, and an early application for the PDP-8 was typesetting using this code. Later, 7-bit ASCII and 8-bit UTF-8 character codes were developed in part as a response to the limitations of five- and six-bit character codes. PDP-8 instructions have a 3-bit opcode, so there are only eight instructions. The assembler provided more instruction mnemonics to a programmer by translating I/O and operate-mode instructions to combinations of the op-codes and instruction fields. It also had only three programmer-visible registers: A 12-bit accumulator (AC), a program counter (PC), and a carry flag called the "link register" (L). For input and output, the PDP-8 had a single interrupt shared by all devices, an I/O bus accessed by I/O instructions and a direct memory access (DMA) channel. 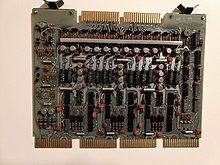 The programmed I/O bus typically ran low to medium-speed peripherals, such as printers, teletypes, paper tape punches and readers, while DMA was used for cathode ray tube screens with a light pen, analog-to-digital converters, digital-to-analog converters, tape drives, and disk drives. To save money, the design used inexpensive main memory for many purposes that are served by more expensive flip-flop registers in other computers, such as auxiliary counters and subroutine linkage. Basic models used software to do multiplication and division. For faster math, the Extended Arithmetic Element (EAE) provided multiply and divide instructions with an additional register, the Multiplier/Quotient (MQ) register. The EAE was an option on the original PDP-8, the 8/I, and the 8/E, but it was an integral part of the Intersil 6100 microprocessor. The PDP-8 was optimized for simplicity of design. Compared to more complex machines, unnecessary features were removed and logic was shared when possible. Instructions used autoincrement, autoclear, and indirect access to increase the software's speed, reduce memory use, and substitute inexpensive memory for expensive registers. Because of their simplicity, early PDP-8 models were less expensive than most other commercially available computers. However, they used costly production methods often used for prototypes. They used thousands of very small, standardized logic-modules, with gold connectors, integrated by a costly, complex wire-wrapped backplane in a large cabinet. In the later 8/S model, two different logic voltages increased the fan-out of the inexpensive diode–transistor logic. The 8/S also reduced the number of logic gates by using a serial, single-bit-wide data path to do arithmetic. The CPU of the PDP-8/S had only about 519 logic gates. In comparison, small microcontrollers (as of 2008) usually have 15,000 or more. The reductions in the electronics permitted a much smaller case, about the size of a bread-box. The PDP-8 is readily emulated, as its instruction set is much simpler than modern architectures. Enthusiasts have created entire PDP-8s using single FPGA devices. Several software simulations of a PDP-8 are available on the Internet, as well as open-source hardware re-implementations. The best of these correctly execute DEC's operating systems and diagnostic software. The software simulations often simulate late-model PDP-8s with all possible peripherals. Even these use only a tiny fraction of the capacity of a modern personal computer. The I/O systems underwent huge changes during the PDP-8 era. Early PDP-8 models used a front panel interface, a paper-tape reader and a teletype printer with an optional paper-tape punch. Over time, I/O systems such as magnetic tape, RS-232 and current loop dumb terminals, punched card readers, and fixed-head disks were added. Toward the end of the PDP-8 era, floppy disks and moving-head cartridge disk drives were popular I/O devices. Modern enthusiasts have created standard PC style IDE hard disk adapters for real and simulated PDP-8 computers. A simplified, inexpensive form of DMA called "three-cycle data break" was supported; this required the assistance of the processor. The "data break" method moved some of common logic needed to implement DMA I/O from each I/O device into one common copy of the logic within the processor. "Data break" placed the processor in charge of maintaining the DMA address and word count registers. In three successive memory cycles, the processor would update the word count, update the transfer address, and store or retrieve the actual I/O data word. One-cycle data break effectively tripled the DMA transfer rate because only the target data needed to be transferred to and from the core memory. However, the I/O devices needed more electronic logic to manage their own word count and transfer address registers. By the time the PDP-8/E was introduced, electronic logic had become less expensive and "one-cycle data break" became more popular. Early PDP-8 systems did not have an operating system, just a front panel with run and halt switches. Software development systems for the PDP-8 series began with the most basic front-panel entry of raw binary machine code (booting entry). In the middle era, various paper tape "operating systems" were developed. Many utility programs became available on paper tape. PAL-8 assembly language source code was often stored on paper tape, read into memory, and saved to paper tape. PAL assembled from paper tape into memory. Paper tape versions of a number of programming languages were available, including DEC's FOCAL interpreter and a 4K FORTRAN compiler and runtime. Toward the end of the PDP-8 era, operating systems such as OS/8 and COS-310 allowed a traditional line mode editor and command-line compiler development system using languages such as PAL-III assembly language, FORTRAN, BASIC, and DIBOL. Fairly modern and advanced real-time operating system (RTOS) and preemptive multitasking multi-user systems were available: a real-time system (RTS-8) was available as were multiuser commercial systems (COS-300 and COS-310) and a dedicated single-user word-processing system (WPS-8). A time-sharing system, TSS-8, was also available. TSS-8 allowed multiple users to log into the system via 110-baud terminals, and edit, compile and debug programs. Languages included a special version of BASIC, a FORTRAN subset similar to FORTRAN-1 (no user-written subroutines or functions), an ALGOL subset, FOCAL, and an assembler called PAL-D.
A fair amount of user-donated software for the PDP-8 was available from DECUS, the Digital Equipment Corporation User Society, and often came with full source listings and documentation. The three high-order bits of the 12-bit instruction word (labelled bits 0 through 2) are the operation code. For the six operations that refer to memory, bits 5 through 11 provide a 7-bit address. Bit 4, if set, says to complete the address using the 5 high-order bits of the program counter (PC) register, meaning that the addressed location was within the same 128 words as the instruction. If bit 4 is clear, zeroes are used, so the addressed location was within the first 128 words of memory. Bit 3 specifies indirection; if set, the address obtained as described so far points to a 12-bit value in memory that gives the actual effective address for the instruction; this allowed operands to be anywhere in memory at the expense of an additional word. The JMP instruction does not operate on a memory word, except if indirection is specified, but has the same bit fields. The standard assembler places constant values for arithmetic in the current page. Likewise, cross-page jumps and subroutine calls use an indirect address in the current page. It was important to write routines to fit within 128-word pages, or to arrange routines to minimize page transitions, as references and jumps outside the current page required an extra word. Consequently, much time was spent cleverly conserving one or several words. Programmers deliberately placed code at the end of a page to achieve a free transition to the next page as PC was incremented. 000 – AND – AND the memory operand with AC. 001 – TAD – Two's complement ADd the memory operand to <L,AC> (a 12 bit signed value (AC) w. carry in L). 010 – ISZ – Increment the memory operand and Skip next instruction if result is Zero. 011 – DCA – Deposit AC into the memory operand and Clear AC. 100 – JMS – JuMp to Subroutine (storing return address in first word of subroutine!). 101 – JMP – JuMP. 110 – IOT – Input/Output Transfer (see below). 111 – OPR – microcoded OPeRations (see below). The PDP-8 processor defined few of the IOT instructions, but simply provided a framework. Most IOT instructions were defined by the individual I/O devices. 00 was handled by the processor and not sent to any I/O device (see below). 01 was usually the high-speed paper tape reader. 02 was the high-speed paper tape punch. 03 was the console keyboard (and any associated low-speed paper tape reader). 04 was the console printer (and any associated low-speed paper tape punch). Instructions for device 0 affected the processor as a whole. For example, ION (6001) enabled interrupt processing, and IOFF (6002) disabled it. Bit 11 caused the processor to skip the next instruction if the I/O device was ready. Bit 9 moved a word between AC and the device, initiated another I/O transfer, and cleared the device's "ready" flag. These operations took place in a well-defined order that gave useful results if more than one bit was set. More complicated devices, such as disk drives, used these 3 bits in device-specific fashions. Typically, a device decoded the 3 bits to give 8 possible function codes. Many operations were achieved using OPR, including most of the conditionals. OPR does not address a memory location; conditional execution is achieved by conditionally skipping one instruction, which was typically a JMP. The OPR instruction was said to be "microcoded." This did not mean what the word means today (that a lower-level program fetched and interpreted the OPR instruction), but meant that each bit of the instruction word specified a certain action, and the programmer could achieve several actions in a single instruction cycle by setting multiple bits. In use, a programmer would write several instruction mnemonics alongside one another, and the assembler would combine them with OR to devise the actual instruction word. Many I/O devices supported "microcoded" IOT instructions. Microcoded actions took place in a well-defined sequence designed to maximize the utility of many combinations. The OPR instructions came in Groups. Bits 3, 8 and 11 identify the Group of an OPR instruction, so it was impossible to combine the microcoded actions from different groups. In most cases, the operations are sequenced so that they can be combined in the most useful ways. For example, combining CLA (CLear Accumulator), CLL (CLear Link), and IAC (Increment ACcumulator) first clears the AC and Link, then increments the accumulator, leaving it set to 1. Adding RAL to the mix (so CLA CLL IAC RAL) causes the accumulator to be cleared, incremented, then rotated left, leaving it set to 2. In this way, small integer constants were placed in the accumulator with a single instruction. The combination CMA IAC, which the assembler lets you abbreviate as CIA, produces the arithmetic inverse of AC: the twos-complement negation. Since there is no subtraction instruction, only the twos-complement add (TAD), computing the difference of two operands, requires first negating the subtrahend. A Group 1 OPR instruction that has none of the microprogrammed bits set performs no action. The programmer can write NOP (No Operation) to assemble such an instruction. When bit 8 is clear, a skip is performed if any of the specified conditions are true. For example, "SMA SZA", opcode 7540, skips if AC ≤ 0. A Group 2 OPR instruction that has none of the microprogrammed bits set is another No-Op instruction. When bit 8 is set, the Group 2, Or skip condition is inverted: the skip is not performed if any of the group 2, Or conditions are true, meaning that all of the specified skip conditions must be true. For example, "SPA SNA", opcode 7550, skips if AC > 0. If none of bits 5–7 are set, then the skip is unconditional. Unused bit combinations of OPR were defined as a third Group of microprogrammed actions mostly affecting the MQ (Multiplier/Quotient) register. 7621 – CAM – CLA + MQL clears both AC and MQ. Typically CLA and MQA were combined to transfer MQ into AC. Another useful combination is MQA and MQL, to exchange the two registers. One of three inter-connected modules that make up a PDP-8 core memory plane. One of three inter-connected modules that make up a PDP-8 core memory plane. This is the middle of the three and contains the array of actual ferrite cores. A 12-bit word can have 4,096 different values, and this was the maximum number of words the original PDP-8 could address indirectly through a word pointer. As programs became more complex and the price of memory fell, it became desirable to expand this limit. To maintain compatibility with pre-existing programs, new hardware outside the original design added high-order bits to the effective addresses generated by the program. The Memory Extension Controller expanded the addressable memory by a factor of 8, to a total of 32,768 words. This expansion was thought sufficient because, with core memory then costing about 50 cents a word, a full 32K of memory would equal the cost of the CPU. A set of I/O instructions in the range 6200 through 6277 was handled by the Memory Extension Controller and gave access to the DF and IF registers. The 62X1 instruction (CDF, Change Data Field) set the data field to X. Similarly 62X2 (CIF) set the instruction field, and 62X3 set both. Pre-existing programs would never execute CIF or CDF; the DF and IF registers would both point to the same field, a single field to which these programs were limited. The effect of the CIF instruction was deferred to coincide with the next JMP or JMS instruction, so that executing CIF would not cause a jump. On the PDP-8/E and later models, the Memory Extension Controller was enhanced to enable machine virtualization. A program written to use a PDP-8's entire resources could coexist with other such programs on the same PDP-8 under the control of a virtual machine manager. The manager could make all I/O instructions (including those that operated on the Memory Extension Controller) cause a trap (an interrupt handled by the manager). In this way, the manager could map memory references, map data or instruction fields, and redirect I/O to different devices. Each original program had complete access to a "virtual machine" provided by the manager. New I/O instructions to the Memory Extension Controller retrieved the current value of the data and instruction fields, letting software save and restore most of the machine state across a trap. However, a program could not sense whether the CPU was in the process of deferring the effect of a CIF instruction (whether it had executed a CIF and not yet executed the matching jump instruction). The manager had to include a complete PDP-8 emulator (not difficult for an 8-instruction machine). Whenever a CIF instruction trapped to the manager, it had to emulate the instructions up to the next jump. Fortunately, as a jump usually was the next instruction after CIF, this emulation did not slow programs down much, but it is a large workaround to a seemingly small design deficiency. By the time of the PDP-8/A, memory prices had fallen enough that memory exceeding 32K was desirable. The 8/A added a new set of instructions for handling more than eight fields of memory. The field number could now be placed in the AC, rather than hard-coded into the instruction. However, by this time, the PDP-8 was in decline, so very little standard software was modified to use these new features. The following examples show code in PDP-8 assembly language as one might write for the PAL-III assembler. /Otherwise, fall through to code below. As shown, much of the text of a typical PDP-8 program focuses not on the author's intended algorithm but on low-level mechanics. An additional readability problem is that in conditional jumps such as the one shown above, the conditional instruction (which skips around the JMP) highlights the opposite of the condition of interest. This complete PDP-8 assembly language program outputs "Hello, world!" to the teleprinter. The PDP-8 processor did not implement a stack upon which to store registers or other context when a subroutine was called or an interrupt occurred. (A stack could be implemented in software, as demonstrated in the next section.) Instead, the JMS instruction simply stored the updated PC (pointing past JMS, to the return address) at the effective address and jumped to the effective address plus one. The subroutine returned to its caller using an indirect JMP instruction that addressed the subroutine's first word. "o               /   Strings in PAL-8 and PAL-III were "sixbit"
They were placed into special ROM cards that provided a few words of read/write memory, accessed indirectly through the use of a thirteenth flag bit in each ROM word. The use of the JMS instruction made debugging difficult. If a programmer made the mistake of having a subroutine call itself, directly or by an intermediate subroutine, then the return address for the outer call would be destroyed by the return address of the subsequent call, leading to an infinite loop. If one module was coded with an incorrect or obsolete address for a subroutine, it would not just fail to execute the entire code sequence of the subroutine, it might modify a word of the subroutine's code, depositing a return address that the processor might interpret as an instruction during a subsequent correct call to the subroutine. Both types of error might become evident during the execution of code that was written correctly. Another possible subroutine for the PDP-8 was a linked list. There was a single interrupt line on the PDP-8 I/O bus. The processor handled any interrupt by disabling further interrupts and executing a JMS to location 0000. As it was difficult to write reentrant subroutines, it was difficult to nest interrupts and this was usually not done; each interrupt ran to completion and re-enabled interrupts just before executing the JMP I 0 instruction that returned from the interrupt. Because there was only a single interrupt line on the I/O bus, the occurrence of an interrupt did not inform the processor of the source of the interrupt. Instead, the interrupt service routine had to serially poll each active I/O device to see if it was the source. The code that did this was called a skip chain because it consisted of a series of PDP-8 "test and skip if flag set" I/O instructions. (It was not unheard-of for a skip chain to reach its end without finding any device in need of service.) The relative interrupt priority of the I/O devices was determined by their position in the skip chain: If several devices interrupted, the device tested earlier in the skip chain would be serviced first. An engineering textbook popular in the 1980s, The Art of Digital Design by David Winkel and Franklin Prosser, contains an example problem spanning several chapters in which the authors demonstrate the process of designing a computer that is compatible with the PDP-8/I. The function of every component is explained. Although it is not a production design, as it uses more modern SSI and MSI components, the exercise provides a detailed description of the computer's operation. ^ a b "PDP-8 Summary of Models and Options". Section - What is a PDP-5. ^ a b Douglas W. Jones. "The Digital Equipment Corporation PDP-8 -- Frequently Asked Questions". ^ Marshall William McMurran, Achieving Accuracy: A Legacy of Computers and Missiles Xlibris Corporation, 2009, ISBN 1436381061, p. 88. ^ a b Schein, Edgar H. (2004). DEC is dead, long live DEC: the lasting legacy of Digital Equipment Corporation. San Francisco, Calif.: Berrett-Koehler Publishers. p. 271. ISBN 1576753050. ^ Douglas W. Jones. "The Digital Equipment Corporation PDP-8". ^ "PDP-8 1965". History Wired. Smithsonian Institution. Archived from the original on 2015-02-17. Retrieved February 17, 2015. 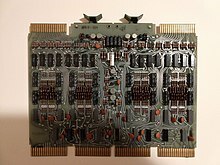 ^ The Rhode Island Computer Museum. "Digital Equipment PDP-8/S, S/N 517". ^ Glenn Rifkin; George Harrar (1988). The ultimate entrepreneur: the story of Ken Olsen and Digital Equipment Corporation. ISBN 978-1-55958-022-9. ^ Small Computer Handbook, NEW PDP 8/I edition (Forward). Digital Equipment Corporation. 1968. ^ a phrase used in Section 1.1 of "Introduction to the Central Processing Unit (CPU)" of a 2007 document about a Texas Instruments microcomputer. "TMS320C28x CPU and Instruction Set (Rev. F)" (PDF). ^ Torben Ægidius Mogensen (August 20, 2010). Basics of Compiler Design (PDF). p. 1. Another advantage of using a high-level level language is that the same program can be compiled to many different machine languages and, hence, be brought to run on many different machines. ^ C. Gordon Bell; J. C. Mudge; J. E. McNamara (1978). Computer Engineering: A DEC View of Hardware Systems Design (PDF). Digital Press. p. 175. ISBN 0-932376-00-2. ^ PDP-8 Floating-Point System Programmers Reference Manual (PDF). Digital Equipment Corporation. September 1969. DEC-08-YQYB-D.
^ "PDP-8 Typesetting System" (PDF). Digital Equipment Corporation. 1965. ^ "Chapter 8: Extended Arithmetic Element Type 182". PDP-8 User's Handbook. Digital Equipment Corporation. 1966. p. 41. ^ "Chapter 4: System Description and Operation". Introduction to Programming (PDF). Digital Equipment Corporation. 1969. pp. 4–22. ^ PDP-8/S Maintenance Manual. Digital Equipment Corporation. 1971. ^ Remo J. Vogelsang (2013). "First-Hand:PDP-8/E OMNIBUS Ride". ^ "PDP-8 - A High Speed Digital Computer" (PDF). 1965. p. 18. ^ PDP-8/S Maintenance Manual (PDF) (5th ed.). October 1970. p. 1-2. ^ a b "PDP-8 Summary of Models and Options (posted every other month)". www.faqs.org. ^ "Table 11. Installation data". Small Computer Handbook (PDF) (1967-68 ed.). 1968. p. 290 (300). ^ "Table 13-1 Installation data". Small Computer Handbook (PDF) (1970 ed.). 1970. p. 277 (291). ^ "SBC6120". 2011-12-05. Retrieved 2016-05-14. ^ "Obsolescence Guaranteed". Retrieved 2016-05-14. ^ FOCAL Programming Manual for PDP-8, PDP-8/S, PDP-8/I, LAB-8, LINC-8 (PDF). Digital Equipment Corporation. 1968. DEC-08-AJAB-D.
^ Mark Smotherman. "DEC PDP-8 Subroutines". 2002. C. Gordon Bell and Allen Newell, 1971, Computer Structures: Readings and Examples, McGraw-Hill Book Company, New York. Chapter 5 The DEC PDP-8, pages 120-136. With enough detail that an electrical engineer could build one (if able to find the parts). Wikimedia Commons has media related to PDP-8. pdp8online.com has a running PDP8 that anyone can control through a Java applet, plus a webcam to show the results. http://simh.trailing-edge.com a very portable simulator for PDP-8, that works on virtually any modern OS. PiDP-8 open-source replica of the PDP-8 using a Raspberry Pi running SIMH attached to a PDP-8 front panel replica. Digital Equipment Corporation's PDP-8 Steve Gibson's explanation on how the PDP-8 works and how to program it. YouTube has a video series showing the PDP-8. "Index of PDP-8 documents". BitSavers.Org web site. Retrieved May 29, 2011.